Tiny Tots Creative Dance: The "unofficial" ballet class for toddlers. This class is a movement class for 2-2 1/2 year olds. These Tiny Tots will learn some pre ballet although, at this age anything can happen, therefore the use of magic wands, musical instruments, and other props will become a big part of this class. For the first few months, parent participation might be required, but we encourage these little dancers to dance on their own. Baby Wearing Ballet: Wear your baby at any age, while participating in a ballet class for YOU. Appropriate for any adult that is new to ballet or at an intermediate level. A baby carrier is not provided. 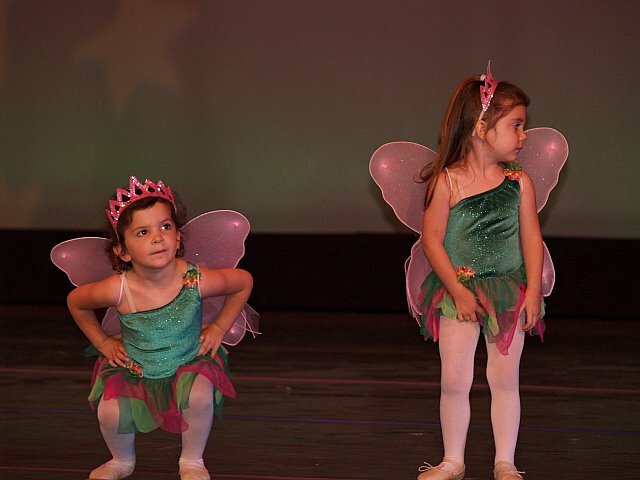 Ballet/Creative Movement: A first course in dance for 2 1/2 to 4 year old children. Introduction to Ballet will be taught as well as Creative Movement, using props such as bean bags, ribbons and rhythm sticks. This class also concentrates on daily motor skills that your toddler will need in their young life. BALLET & TAP Combination Class: Students age 5 to 7 will be prepared for formal Ballet study as they practice exercises that will build strength, coordination and balance. Introduction to Tap Dance movements will be taught with emphasis on building of rhythm and coordination. BALLET: Classes are available at all levels from beginner through advanced. Classical ballet classes will concentrate on correct body placement and conditioning will be stressed as well as the fundamental ballet positions and terminology in an atmosphere that developes enjoyment in movement. HIP HOP: Street style dance as seen in music videos and on today's television. Style and flair are added to this funky dance genre, as well as poppin', lockin', and freestyle. JAZZ: All levels from beginner to professional. This class will teach the latest styles of jazz dance while working on leaps, jumps, turns, and extensions, as well as traditional jazz technique, to pop and dance music of today. KIDZ BOP: A basic introduction to hip hop street dance for the young dancer. Dancers will learn the basic steps and terminology of this urban style of dance. To learn more please look under our "Hip Hop" section. LYRICAL: Ballet and Jazz Techniques combined to form a flowing energy of contemporary dance. Learning to express individual emotions through music and dance while stressing proper technique and alignment. MODERN: An expression of abstract movement that allows the dancer to use his or her own creativity during improvisation. Graham, Horton, and Limon techniques are only a few styles of modern dance that will be taught. MUSICAL THEATRE A combination of singing, acting, and theatre dance. Students will build confidence in a comfortable environment while performing and practicing improvisation in dance and acting. POINTE: Pointe technique is only for the advanced ballet student. Pre-requisite: concurrent registration in Ballet at Destined to Dance and instructor approval. PILATES: Private and group classes offered in classical Pilates Mat Training. Excercises that strengthen the core muscles as well as your arms, back, and legs. SPECIAL NEEDS CLASSES: This class was developed for kids with all levels of autism, but is not limited to just autistic children. We will use various props and intruments to encourage a fun and safe play. We will work on balance and coordination with these children. Some dance with be taught, but each class will be developed according to the students. STORIES, MUSIC, & MOVES: Dance, Play & Learn with your little one, ages 6 months to 36 months. We will sing, read and shake to the beat. Parent or Guardian must attend. We understand that families have busy schedules and the mood of a toddler can change hourly so we created a pay-as-you-go-class with your family in mind. What better way to introduce your child to a classroom environment without any pressure on them or commitment? Single trial classes are never a good way to decide if a school or specific class is for your child since every child has some apprehensions on their first day. Toddlers must try something new like a dance class more than once before they feel comfortable which allows you to make an educated decision regarding continuing. Pay-per-classes for music and dance do not even require a phone call ahead of time, just arrive 10 minutes prior to class time. A cash payment is made upon arrival and then you may come once, twice, or every single week without notice, its your choice. Preschoolers can change their minds daily, babies can miss a nap, or have a bad night which make it difficult to attend other activities which you have pre-paid for. TAP: Beginner to advanced levels are offered. A systematic building of vocabulary and technique will be stressed as the students' rhythmic and performing abilities are developed. TUMBLE FUN: A combination of tumbling using gymnastics mats and Jazz dance. The students will learn balance and grace while learning the basic fundamentals of gymnastics and jazz technique. YOGA: Hatha style yoga combining breathing techniques with stretches to promote relaxation, stress relief, and flexibility. ZUMBA: Fuses hypnotic latin rhythms and easy to follow moves to create a dynamic fitness program that will blow you away! Ditch the Workout, Join the Party! Private Classes available in most styles of dance! Register now for our Fall Classes! A non-refundable $25 registration fee per student and the first month of tuition is due at the time of registration. You receive a 10% discount if you pay in full at time of registration. Two additional payment options are available (a) nine payments via cash, check, Visa or Mastercard, or (b) nine automatic monthly debit from your checking account, on the 1st of the month. There is a $35 return check fee for all returned checks, and cash must be paid after receipt of one returned check. A $25 late fee will be assessed to all accounts where payment is not received by the due date. If payment is not paid by your child’s second class of the month, including the $25 late fee, your child will not be permitted to participate in class-no exceptions. Tuition can always be paid in advance. All payments can be placed in the white mail box on the wall near the door and cubbies. If you are paying cash, and no one is present to give you a receipt, please place all cash in an envelope located on the desk and write the student’s name and what the payment is for before dropping it inside the box. If you decide to discontinue the automatic payment plan, a ‘Discontinuing Automatic Payment Notice’ must be filled out in our office 30 days prior to the date of discontinuing. Charges on your card will be made for all tuition and fees 30 days after the studio receives the Discontinuing Notice. Phone calls & E-mails will not be accepted as a notice to drop automatic payment. Conveniently, for our adult students you can purchase a class card for $135 (plus registration fee) for 10 classes. Each time you attend class, your class card will be marked. After 10 classes, you renew your card. Class is not always cancelled if the local schools are cancelled since the weather can change hourly. We will only close if instructed to close by the state, county or town due to weather conditions (i.e. state of emergency). A message will be left on our machine an hour before your scheduled class. If class is not cancelled, but you would prefer not to attend, please call or e-mail to let us know. You may make up missed classes due to weather, in another class. Destined to Dance is rapidly growing thanks to all of our students and their referrals. As a special gift to you, for every family that registers at Destined to Dance and lists your name as a referral, you will receive $10 off of your tuition. Thanks again! Come Join us at Destined to Dance!